Manowar Anthology has so much metal that it wore my needle thin. I’m heading down to the builder’s supply to get a steel rod to fix my record player. Who’d think that these cute beefcakes can produce such a mighty sound. 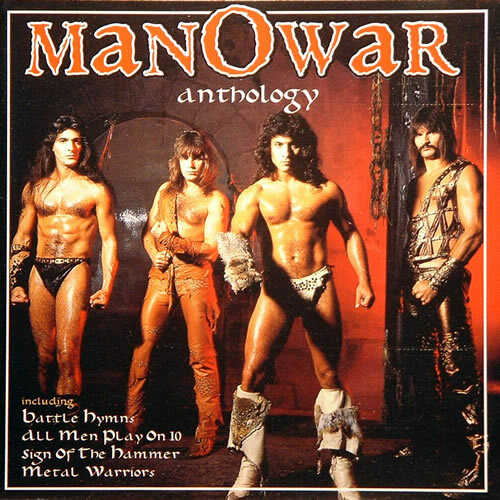 In fact, why don’t you listen to one of Manowar’s songs for yourself. It’s got all the staples of heavy metal. The drummers is jackhammering the skins. The guitar’s are screeching in ecstasy and there’s plenty of vocal gymnastics. This is white boy music although the performers are gay. This entry was posted in Records and tagged Bad record covers, gay, Manowar, metal. Bookmark the permalink.